After what Mayor John Tory described as a “personally agonizing” battle to reconcile police carding with public good, he has called for an end to the controversial practice. The announcement, made at press conference Sunday afternoon, marks a dramatic change in course for the mayor. Tory previously called for a “reform” of carding, a notion that community activists and establishment figures dismissed as insufficient. Carding, the police practice that Tory says has “eroded public trust,” involves police officers approaching members of the public and asking them for personal information and identification without suspecting them of committing a crime or needing them for investigation. The information recorded by officers is then kept in a searchable database; analysis of the database shows that officers disproportionately stop black and other visible-minority residents, and community groups have decried the practice for years. Carding was suspended by the force in January. 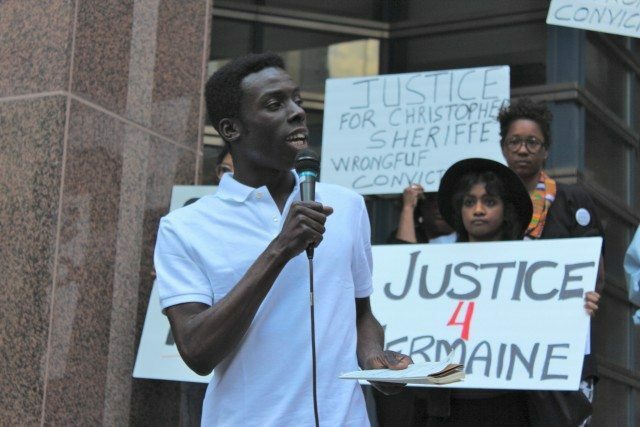 Among the prominent Torontonians and Ontario Human Rights Commission members who have recently spoken out against carding, one of the most vocal has been journalist and activist Desmond Cole (a Torontoist staff writer), whom Tory said helped change his mind on the matter. Desmond Cole speaking out against carding at a Black Lives Matters rally in front of Toronto Police Headquarters. Cole brought light to the issue after writing a Toronto Life cover story about his personal experience about being black in Southern Ontario. In it, he writes that he has been stopped by police 50 times—despite not breaking any laws—and how the fraught relationship with police has led to him feeling like a prisoner in his own city. Anthony Morgan is a policy and research lawyer at the African Canadian Legal Clinic, an organization that has lobbied the police services board several times to put an end to carding. In an interview with Torontoist, he described the experience of being carded as humiliating. “Imagine an individual walking along, minding their own business and then having to talk about a very personal issue with a stranger in public,” said Morgan. He added that he didn’t expect the mayor to make this announcement. Councillor Michael Thompson (Ward 37, Scarborough Centre) says he wasn’t surprised that the mayor changed his stance but did not expect it to happen so soon. Thompson, the only black member of city council, is one of the 50 Torontonians that involved with Concerned Citizens to End Carding. During his time on the Police Services Board in the previous term, he spoke out against carding as harmful to the community. “I don’t think it’s a surprise that the mayor was under public pressure and pressure from a variety of different sources from people who are fair minded,” said Thompson about Tory’s changed stance on carding. He is cautiously optimistic of what’s to come. 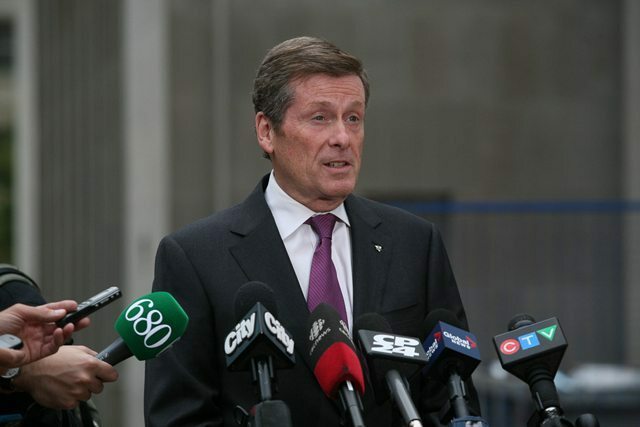 Despite the significance of Tory’s change in position, the mayor warns that he is only one vote on the seven-member Toronto Police Services board. But there could be support from other members. In a column for the Toronto Star, board chair Alok Mukherjee asked that information obtained from carding no longer be kept in police databases. “The notion that information about innocent citizens not engaged in or suspected of any wrongdoing is ending up and residing in police databases forever to be used in ways that could jeopardize their safety and future is deeply offensive,” wrote Mukerhjee. Mukherjee added that police chief Mark Saunders agrees with his stance on the databases, but Saunders has vocally supported the carding, saying that abolishing it would lead to more crime. Tory said he will bring up the issue to the board during the next police board meeting. “Over the next few months, I am hopeful that my board colleagues ‎and I can work with Chief Saunders and with the police officers and with the community to achieve our shared objective of putting in place an approach that will both help keep crime low in every neighbourhood in this city, while protecting the fundamental rights of every citizen at the same time,” Tory said. To date, Toronto Police Service has not provided public evidence that this is the case.